Ahead of the Curve – Syndicated NFL and NCAA Email Column – 25+ Annual Emails – Includes everything from NFL Camp Scouting Reports to NFL Draft and Free Agency Info – late Aug thru June. Our scouts attend NFL and college camps, practices, games and offseason workouts that gives a unique football insight throughout the year not just over reported news stories. Top 100 Pro Prospects – Updated Top 100 Pro Prospect rankings by the best scouting staff in the nation. Exclusive for Full Subscribers of $69.95 package – Nov. thru April – multiple times. 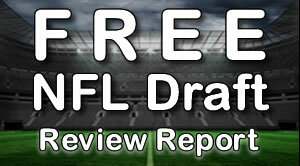 NFL Draft 2019 Email Service (Exclusive emails thru May)- This Email Service will only be FREE to Full Subscribers of the $69.95 Deluxe Package – special features thru May. NFL Draft Chart – (Jan) In-depth chart that translates trades of draft choices with specific value for each selection. Extensive Scouting Football Glossary – (Jan) Complete glossary of Scouting and Coaching terms and language. NFL Online Draft Review – June ’19. Complete NFL Draft Review shortly after draft. NFL Online Draft Review – June ’19. Complete NFL Draft Review shortly after draft/mini camp. The Best and Most Comprehensive Yearbook on the market. The Bible for every NFL front office. The nation’s most accurate draft projection. Over 800 college players rated with over 250 In-depth Online Scouting Reports and draft projections. Detailed Scouting rating on all top players – breakdown of all key areas of play for their position. True small college sleepers that you will not find anywhere else. Famous “Hindu Theory” for all top players. Complete player directory. Player Indexes. Top 300 Value board. Complete seven round Mock draft. Read Sample Pro Prospect Scouting Reports from ‘2000 thru ’18 Yearbooks. College ’18 Season – Positional Rankings – Sept thru April. Pro Prospects with 2018 early season rankings. Highly regarded juniors rated. NFL Draft ’19 Rankings – Early season updates on Pro prospects including breakout senior players. Pro Prospects ’18 – Postseason Rankings – Dec – NFL Pro prospects after the ’18 College regular season – Frank Coyle was a 20 year Scouting Consultant for the Senior Bowl and several NFL clubs annually. Jan ’19 Newsletter – Underclassmen declared for the NFL Draft. Every All-star games graded and evaluated. 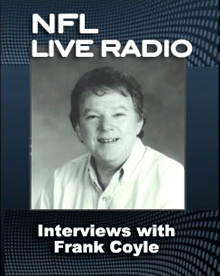 Frank Coyle is a Scouting Consultant for several All-star games. Feb ’19 Newsletter – College players evaluated, Final All-Star games scouted, mock NFL Drafts, Early NFL Combine and NFL Free Agency news. March ’19 NFL Free Agency Newsletter – complete FA rankings and scouting reports. NFL Combine and Pro Day ’19 Report – April – NFL Draft ’19 Combine News and workout results. All 32 NFL teams evaluated, Short List Prospects, Free agency grades, NFL team tendencies, Draft needs & complete 7 Round Mock draft. Traded Draft picks. Special player sections. Blue chip players, rising, falling, underrated, overrated and sleepers. Our NFL Team Report 2018 had over 80 direct hits with NFL teams with exact drafted player and only through the middle rounds. Latest News Before the NFL Draft. Rising and Falling Players, NFL trade rumors and special player ratings. “Marion Butts Theory” players (Terrell Davis was the highest rated player of the ’90s and QB Joe Flacco was our highest rated player since 2000). Final Seven round Mock Draft with early rounds evaluated. “Dirty Dozen”, the Top 12 Small college players evaluated plus top 50 overall small college prospects. Final Value board Top 300 Pro Prospects. Latest NFL Draft evaluation just days before the three-day event. Rumors, trades, late signings and NFL info. All 32 NFL teams rated on the complete NFL Draft ’18. NFL Section – 35 pages – Complete Draft Sequence. NFL Draft facts – Best Values – Biggest Reaches – 1 page+ per NFL team with complete Veteran Free Agency Updates, Rookie Free Agent signees, rookie salary cap, NFL mini-training camp reports. NFL Supplemental Draft ’18 Report. NFL Training Camp Dates. 2017-2018 MEMBERS- Please log into the Draft Insiders’ Digest Archive. 2016-2017 MEMBERS – Please log into the Draft Insiders’ Digest Archive. 2015-2016 MEMBERS – Please log into the Draft Insiders’ Digest Archive.